Marce Pehpot's invitation that I be one of Sati's godmothers opened up lots of opportunities for me to network with other wonderful and fabulous Mommy bloggers. It also made me feel like I have a home in the blogniverse that I can truly say "I BELONG HERE"... thanks to this sisterhood that is popularly known as the MARCE CLUB. It is no surprise then that I get so many link love and visits, well wishes and encouraging words from them, be it publicly or privately. Thanks Marce Seiko for this beautiful award. 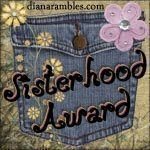 The gift of the Marce Club's spirit of sisterhood is more than enough for me to survive the blogniverse. I am just so blessed to have you known you guys, albeit virtually. To all my other Marces, this one goes to you guys!